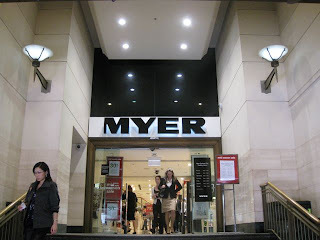 I am led to conjecture that Myer is the Australian equivalent of London's John Lewis. They have a similar appearance, sell similar things and are both in the shadow of a mightier competitor (in Sydney this would be David Jones and in London, the marvellous Selfridges - both of which are decidedly classier than their lesser cousins). Myer however can't boast the magnificent slogan "Never knowingly undersold" as John Lewis. 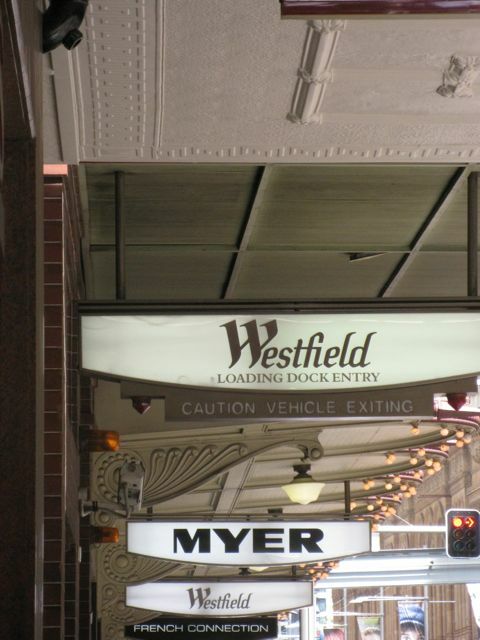 Rather, their utterly feeble tagline is "Myer is my store" upon which they no doubt lavished a fortune. Sigh. I only ever go to Myer in order to buy one of two things - Clinique shaving gel or towels. For everything else its David Jones any day. There you can buy (at a price) Fortnum & Mason tea (but only the bog standard ones), Ben Sherman shirts, L'Occitane shampoo, Arabia moomin mugs (except for the limited edition ones), bed linen, French cheeses and 2xist underwear. It almost makes you think you're living in a civilised country. Except for the service (impossible) and the willing helpfulness (non-existent). I once asked in David Jones whether they could get some Mouchoir de Monsieur, a perfume by Guerlain that originated in the nineteenth century and was worn by Proust. This was in March. "Oh no", the assistant brayed, "we only order perfume in once a year and that's for Christmas." And that was that. I then asked in the Food Hall whether they could get some Russian Caravan tea. "Is it on the shelf?" No, I replied. "Well then we can't." Right-ho. Thank you very much. You've been so helpful. Australia. Where you have to remember that to serve someone is a bad thing. It brings back feelings of colonial shame. Must remember to be rude instead. Even when I don't have shaving gel or towels to buy there is something that draws me back to Myer rather frequently. A guilty secret. My guilty pleasure. 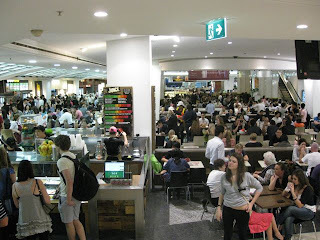 This is Myer's Food Hall or, to give it it's proper name, Sydney Central Plaza Food Court. Underneath the department store is a huge cavern, lit brighter than hell, and this, dear readers, is a food court. Firstly, I need to explain to any Australians that unlike Sydney where every building larger than a house seems to have one London doesn't teem with food courts. I can't think of any back home. Hang on a minute, I have some vague memories of one in the Trocadero Centre near Piccadilly Circus: but that wouldn't really count because only tourists step foot within that hideous hell-hole. So, instead of pigging out in brightly-lit food courts we Brits go to discrete little sandwich shops. Pret A Manger. Marks & Spencer. Bite. Caffe Nero. Eat. Le Pain Quotidien. Konditor & Cook - the list of those is endless. So food courts have an exotic quality for me, despite the fact that really there is nothing more vulgar. They remind me of touring with the David Glass Ensemble around South East Asia for three years (over a decade ago now) when we would fall upon a food court in Hong Kong with ravening glee after spending a month braving five hundred year old eggs and fried chicken feet in somewhere like Kunming. We might, back then, even have been tempted to eat the odd, ahem, burger. A little bit of Asia then is conjured up for me whenever I descend the escalator to Myer's Food Court - but it's certainly not by the food. Despite the fact that in the Sydney Central Plaza Food Court you can eat in any country you want - Mexico? check; Turkey? check; China? check; Japan? check; Vietnam? check - nothing, absolutely nothing, is authentic. 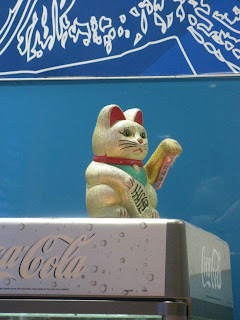 Not a herb or a spice or an unusual condiment is allowed past the Food Court's draconian watchdog for here we proudly fly the flag of mediocrity. If the food is so bad, why then do I like it? 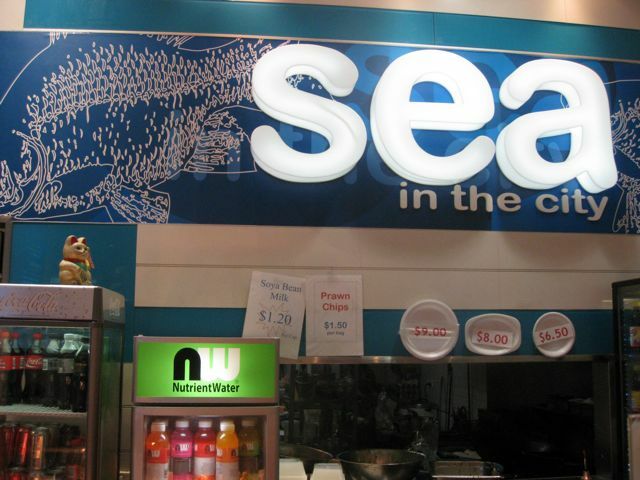 Sea In The City is really a chinese take-away in disguise. From a distance you think you're in for a lovely healthy steamed fish or perhaps a lightly battered Barramundi or a round of rock oysters but instead (this is a Food Court after all, the Devil's own restaurant), upon reaching the gleaming counter you are confronted with pile upon pile of glistening sauces and stack upon stack of deep-fried morsels, all betokening an early grave. The Spicy Salt & Pepper Squid (above, bottom right) is my particular guilty pleasure, my heart-stopping indulgence. 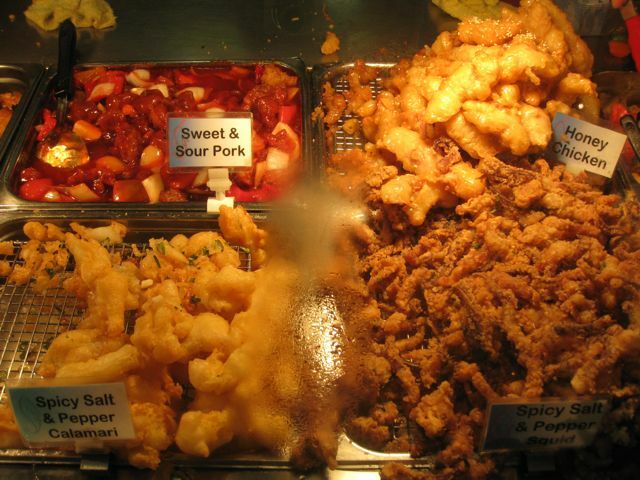 Crunchy tentacles of squid, deep-fried in a crispy salty batter (oops, where's the spice?) 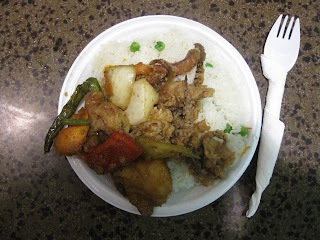 are served along with another dish of your choice (crispy spicy fish with a surprisingly large number of vegetables but, yup, undetectable spice) on top of rice flecked with the odd vegetable (more would obviously be unhealthy). This feast, served up on a cardboard plate, comes to the grand total of $6.50 (at today's conversion rates this comes to a paltry £3.95). I would like to point out that my server today was rather stinting with her portions. Normally I have to stagger away from the counter under an enormous weight of deep-fried sea-food, tip-toeing to a seat in order not to cause a seismic shifting of battered squid from my groaning paper plate. Today, I think she was rather put out at my taking photographs and she punished me accordingly. Once sat down at your fake marble table, there are two problems with eating the dish. Firstly, the smallest plate (your £3.95 option) is still too much for lunch. I usually have to leave something behind, wilting under the high-wattage lighting on the side of the plate. Secondly, you have to eat the thing with a plastic fork which is well-nigh impossible. The fork bends, it sways, its prongs refuse to enter into a discussion with anything tougher than a pea. Frankly fingers would be better. 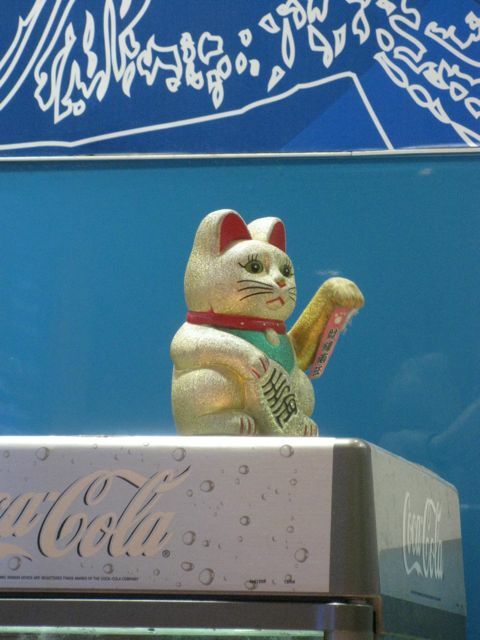 But we have standards to maintain at the Sydney Central Plaza Food Court and fingers are a big no-no. Whilst tucking in to my guilty squiddy pleasure I spend the time people-watching. My fellow guzzling gourmands amaze me with their stamina, with the huge quantities of food they are able to hoover up. I wonder whether they contemplate having dinner as well and note that their waistlines often admit to it. Spotting who lives here and who is a tourist is always fun. Looking down on those with their KFC and their McDonalds is a good game (although I know that my plate contains more salt than a dozen Super-Sized BigMacKingBurgers and that the working conditions at Sea In The City are probably not the best in Australia). Frightening children by drooping tentacles out of the side of one's mouth is always entertaining. Gazing into space vacantly is encouraged and a lovely way to rest the mind whilst chewing squid. Watching people go up and down the elevators and pondering would it be too much to expect them to walk is not allowed. I am now taking myself out to lunch! I fear for your soul. No to plastic forks! Travel at all times with your own cutlery - I have a bamboo SPORK in my bag, it is a beautiful thing, I bought it in the shop at the Walker Art Gallery in Minneapolis (which I loved loved loved and miss every day I am not there in its chilly white embrace with attached sculpture garden and fabulous shop where they do understand service). I don't think anyone should ever eat anything with a plastic fork it is cruel to your food as well as your poor, crushed, Australia damaged soul. On that subject WHEN ARE YOU COMING HOME THE UK IS FALLING APART WITHOUT YOU?